With over 4,000 restaurants in the Greater Fort Lauderdale area of which 200-300 close each year you would think with all the competition that an owner of one would do their best to be prepared every hour they are open. Recently I was at a restaurant that was out of THE item the food critics raved about and then the owner argued with me as if it was my fault. When a restaurant introduces something new do the next 50 restaurants that open have to imitate, not better, that item? Okay I am personally tired of bacon on and with everything and kale having to be a must on every menu. Do I really have to see 'Be nice' on restaurant walls, in bathrooms, on coffee cups, menus, etc.? It's a nice thought but I hope the next new restaurant comes up with a better play on those words. I personally prefer to eat lunch after the crowds are gone which means around 2 PM. Does that mean I have to miss out on the restaurant's specialty? Does that mean I have to eat food that has been on the steam table too long, have bacon that has been so overcooked that it tastes like cardboard? 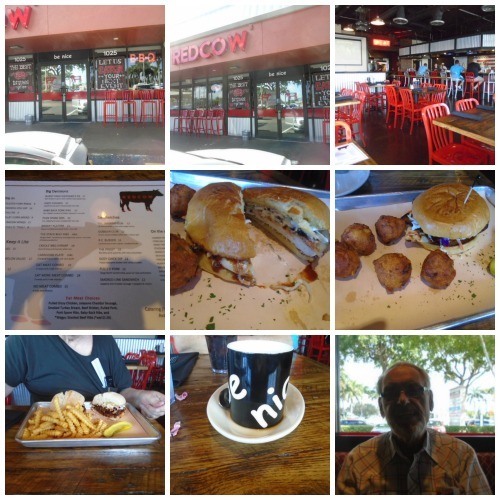 The Red Cow has been in a spot that has been at least 3 other restaurants that I remember, the previous one also a bbq spot that couldn't bother to serve coffee. At least the Red Cow does. I had one of the 'specials' of the day described as a chicken breast with spices, mayo, pickles, slaw which sounded like it would be a big sandwich--it wasn't. The server didn't mention the price, which seems to be the latest habit when specials are told, but it sounded good enough that I wanted it. Whatever the price it wasn't worth it. Allen had the piglet sandwich which is boneless pork spareribs on ciabatta and the meat was dry and 'hard'. We got in a little late, about 3 PM, and obviously because after taking our order and serving our drinks the server disappeared, our food was served by someone else and another server, called 'AM NORTH BAR' on the receipt, checked how everything was and I told her how bad the sandwich was. She did immediately offer to get me something else but I said that it was okay and I would finish what I had. When AM NORTH BAR brought the check she told me she took the sandwich off the check which did surprise me but certainly was appreciated. With their sandwich prices running from $11 to $13 and the piglet sandwich costing I added another $13 for the chicken sandwich we left a little better than a 30% tip. The biggest complaints I hear about restaurants is the lack of good service which is something I very seldom encounter and the 3 servers at the Red Cow certainly were professional but because of the food I won't go back again. Doing research for my opening paragraph I looked at the last 100 restaurants I have reviewed and a high number have closed. It is time for restaurant owners/chefs/managers start looking at what they are doing wrong, listen to customers, read their reviews and do something about it besides dismissing what their customers are saying before they become another statistic joining the 200-300 restaurants that will close this year because even some of the better restaurants do.